Composer Michael Gordon at his studio on Desbrosses Street in lower Manhattan. Autobiography and choral music have no mutual history. Choruses are the sound of "we," not the "I" that comes with telling your own story. Amassed voices suggest the next world, not ours. 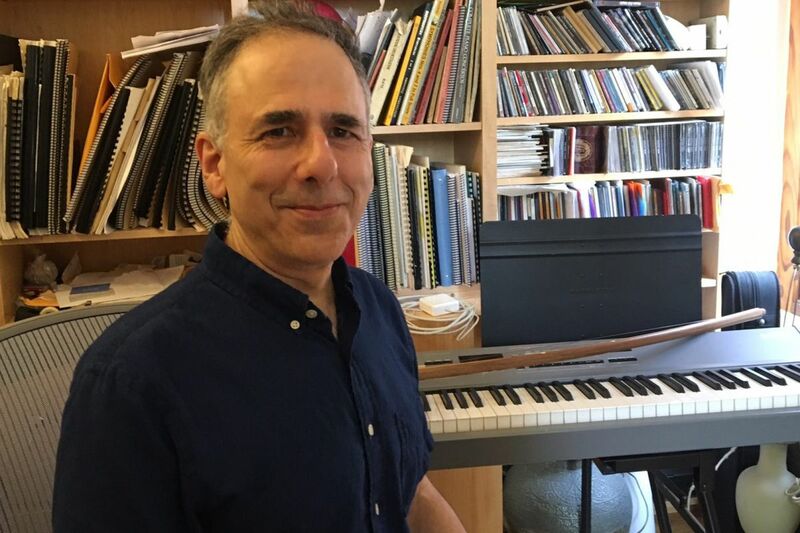 Nonetheless, composer Michael Gordon wrote a prose-poem account of key events in his life — people and events he has known and married, plus some personal introspection — and conveyed them in the choral medium in ways that were unimaginable walking into the concert but made solid sense by the end. The piece was Anonymous Man, premiered Saturday by the Crossing choir in the closing of its Month of Moderns festival under Donald Nally at Presbyterian Church of Chestnut Hill. The nine movements are centered around Desbrosses Street, once a post-industrial no-man's-land in downtown Manhattan where the composer took up residence in an abandoned caviar factory in 1980. Now, as an established core composer in the cutting-edge Bang on a Can collective, Gordon looks back somewhat in the spirit of Ernest Hemingway's A Moveable Feast with deep feeling but not sentimentality. How it works: Most movements had a basic musical frame, often in the form of an ostinato bedrock over which the text was sung in a natural, somewhat conversational way, resembling the rhetorical style of Gordon's Bang-on-a-Can colleague David Lang. As each movement went on, though, words and pithy musical themes mixed and morphed into purely musical constructions where the words, having been established, were incidental amid some marvelously evolving effects suggesting anything from Morse code to call-and-response as singers seemed to address each other from afar. Each movement had its own subject matter — homeless people who lived on the block, Gordon proposing to his wife, Julia Wolfe, on the fire escape, or the tragedy of 9/11. But one of most distinctive sections was on something Gordon did not witness firsthand: the 1865 arrival of Abraham Lincoln's funeral train. Gordon uses surface descriptions of the event with cinematic detail, creating great emotional immediacy, especially with the dark-hued vocal sonorities that make you feel the black crepe. Only one movement failed to make its point, perhaps because the point is beyond being made, and that's in the 9/11 section. Gordon's compelling text contrasts the pristine weather with explosions that obliterated everyday life. But the music's rhetorical style — not to mention woozy glissandos — fails to make a clear impression. Also, here and elsewhere, Gordon's endings don't feel so conclusive. But the final movement, titled "I sleep at home," put a gratifying cap on the whole piece. Rather than observing his world, he examined his gratitude for an indoor life not known to his homeless acquaintances. Here, all voices in the Crossing seemed to have their own separate musical line, creating a sense of harmonic expansion that made the actual room feel continuously larger as the music went on. Anonymous Man leaves the impression of being an important piece, and a creative leap forward for Gordon — a case made by the Crossing's performance, which had some rough edges in the opening movements but brought out many moments of subtle emotion that made you want to hear the piece again. Immediately.